I have added a manifest to the windows executable, so display should not scale in windows 8/10. Can anyone check if this works? Windows 8.1. Working full screen out of the box! How much will it change until the deadline? 1. I see that you changed amount of powers that spawned; It feels perfect now! 3. Timesync turned on automatically for me I think; it stutters sometimes when you press buttons especially when you're moving forward or back. It gives the game a sluggish feel. Nice to know vibration works. I agree the levels are a bit too long, specially 3. Already talked to Lachie about this. I'll reduce them a bit before the deadline. I don't think what you describe is timesync's fault. Some shots will cause you to move slower while you use them, and that's intentional. You must stop shooting to move faster. Anyway, you can disable timesync completely by setting timesync=0 in the .ini. I don't know what's happening but I did some testing by tweaking the .ini. It seems like the FPS fluctuates a lot when I actually play the game regardless of what the fps is; and this is why I'm feeling the jerky gameplay. It is not related to objects on screen because it happens even when only the horse is on the screen. Game takes about 20% cpu in gameplay. Weird, I have tried with some much slower cpus and multithreading on, and it didn't happen. The threads don't do much, they just sort sprites by priority and handle particle movement. The threaded input was disabled by default a few versions ago, because it was causing problems. Something might be getting stuck. Nice to know the workaround is already there. I'll see what I can do to use the best possible defaults. Niiice! Now that's what I wanted to hear! I'm still working on level maps, polishing some graphics and testing the new mechanics. There may be a few changes. He guys. We are approaching the last 24 hours. I remind you, the deadline is 11th of February, 18:00 GMT (not your local time). At that time I will download all the last available download links and versions. Make sure you have all in order. For round two, I see Gothon, badidea and Tourist trap continuing with their work. Anyone else? ChangeV wrote a love letter to FreeBASIC chan. but there are love-crazy enemies everywhere. They will try to approach FreeBASIC chan with various things like love letter, heart, or even the money. 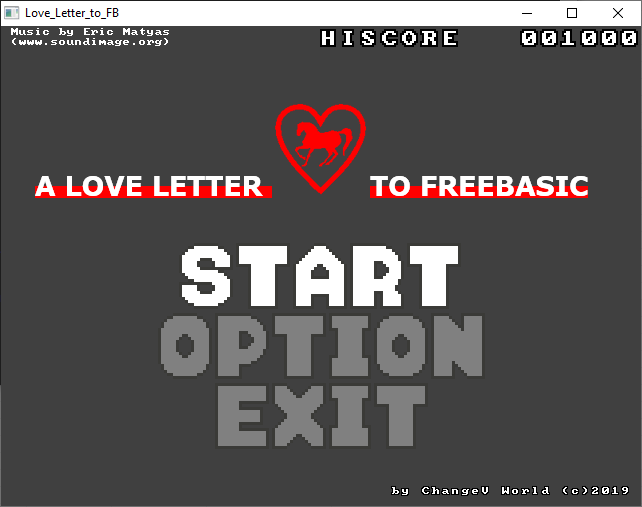 beat them all and win the heart of FreeBASIC chan. but, beware... some enemies are immune to weapons. ChangeV needs to find a different way to beat them. When enemies are beaten to death, they will stay on screen and confuse the player. as more enemies pile up on screen, the battlefield will become crazy mayham. stay sharp and good luck. Z key to throw the axe. Joypad is supported but only tested with XB360-wired and PS-mini classic joypad. default setting is for xb360 joypad. so If you want to use joypad, be sure to go to option meanu and remap the button. I couldn't use SBsound... I had no free time to test/learn it. so I just reused old FMOD sound code and seems works ok on both win10 and xp. I see two playable games so far, do we have any more submitted? Looking forward to playing them all! In the official forum there is more. The one I listed. What's up with your entry? This better blow my socks off. It crashes immedately. And you need to provide the source to be eligible. Please fix this.